Today with all the hype about binary options online trading, many binary signal trading services have sprouted up all over the internet claiming to be able to help beginner traders improve their wining ratios. Sadly, most of them wouldn’t last a year in this ultra competitive industry. Nevertheless, there is one binary options online signal provider that has been around for the last 7 years. We assume that this is mostly likely due to the tremendous support which this provider has received over the years from its subscribers. Established in 2010, UpDownSignals is the longest surviving binary options online signal provider in the industry today. To find out more about this signal provider, let’s take a look at what makes them so special. UpDownSignals uses “financial maps” to create a trading solution which has been put through an algorithm model. Before the system can come up with the statistical probability of a trading opportunity, it has to undergo a 5 steps signal creation process. First of all, data about the asset is collected and used to determine how the asset will react with the statistical models. Assets which react unfavourably according to the statistical model are then dropped from the list. Assets which are validated from step 1 are then put through another algorithm in order to determine the forecasted trading volume and sizes. The result is then compared against historical data to see if the forecasted values match up with the prediction. For assets which have passed step 2 are then closely monitored to observe how their prices behave during the first 30 minutes of trading. Once the list of assets have passed step 3, the list is further refined by measuring their performance through 4 different mathematical models in real time. The final step involves filtering out the weaker assets leaving behind only the best potentials for the trading opportunities. Based on their ranking, the strongest 5 candidates are then sent out as trading signals to the subscribers of the signal service via SMS at 16:30 (GMT). However it should be noted that although the signal service delivers up to 5 signals per day, the average number of signals per day around 3 signals. But there can also be days where no signal is delivered at all. This is to be expected especially when it is unclear which way the market will go. Once you have received the signal alert, you can decide which signals that you want to act on and which ones you want to disregard. As a general rule, UpDownSignals are delivered in a user friendly manner. Only the important information is provided. For example, a trading signal is sent by SMS will be depicted as “signals for 15/02/13,expire time 19:32GMT -A-,S&P500,Put,1522.7 -B-,USD/CAD,Call,1.0064 -C-,USD/CHF,Put,0.9232”. This means the signals for 15th February 2013 will expire by 19.32 GMT. Signal (A) refer to the prediction that the S&P 500 will go down and traders should place a “PUT” trade with the strike price at 1522.7 or above. Since the UpDownSignals system is purely a signal service and based on SMS alerts, it does not require any integration with any form of trading platform. In other words, the signal service is suitable for both Forex and binary options online trading. 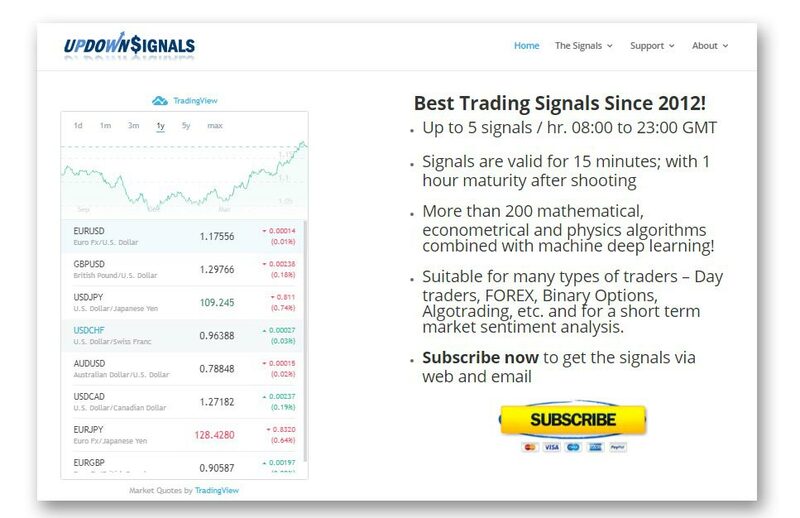 Since the trading signals are sent on a daily basis with an intraday validity period, the signal service is suited for day trading. As such, UpDownSignals has also provided certain guidelines on how to use these signals effectively for day trading. Overall, the result seems impressive and realistic. Our survey of the results obtained by actual users of this signal service yielded similar findings as well. In terms of customer support, UpDownSignals has provided a fairly comprehensive FAQ where the most of the questions that you want to ask are provided with answers. In addition, subscribers of the service can also reach out to customer support by filling out the web contact form on the website. Our verdict at the end seems to indicate that this is a bona fide signal service. As for their accuracy, the signal provider did not make any wild claims as to the signal success rate. Instead, they have gone to the extent of publishing the results of the signal service from as far back as 2012. Our independent survey of the results also seems to back up what UpDownSignals has claimed. Our conclusion at the day is this signal service provider is definitely worth a try. With only $25 for a one week trail, it is money well spent. Choices of Plan – this is an excellent feature, as not two traders are alike. Does not support automated trading hence physical intervention is required to execute a trade. How many Signals will I receive in a day? On the average, subscribers will receive 1 to 5 signals per day. How are the signals sent out? All the signals are sent out by SMS on w worldwide basis at around 16:30 (GMT). How much does it cost to subscribe to UpDownSIgnals’ service? You can choose from 3 plans which is the $25 weekly plan, the $97 monthly plan or $197 quarterly plan. Yes, UpDownSignals is a legitimate signal provider and is reliable. В интеренете нашел интересный web-сайт со статьями про kamod.net.ua.